Developing a list of telemarketing leads and knowing how to best target and reach these leads is a complex process. Telemarketing leads can come from internal company databases or external phone lists. Each of these types of telemarketing leads requires a different approach and sales presentation in order to best reach customers and obtain new subscriptions. At The Pisa Group, we have experience locating effective telemarketing leads and delivering marketing campaigns to these individuals. If you are interested in our outbound telemarketing services for customer retention and acquisition, please contact our call service center and telemarketing company to learn more about these services and to receive information about how we can develop a campaign for your newspaper. At The Pisa Group, we find that the best telemarketing leads for newspapers can actually come from within your company. This includes recent stops and no pay customers as well stops from months or years in the past. When calling previous customers, it is important to use a carefully planned sales presentation and approach. At The Pisa Group, our sales representatives have experience calling these types of telemarketing leads. We understand the specific needs and concerns of this group and can use this knowledge to overcome objections and close sales. Another way to discover telemarketing leads from within your company databases and information includes using the latest technology and programs to create and review a marketing database. In this approach, our trained personnel will look at specific demographics and other characteristics that make prospects and customers more attractive telemarketing leads. We can then use this information to target specific leads and develop effective telemarketing campaigns. In addition to finding telemarketing leads from within your company and existing company databases, we can also help you locate and target additional telemarketing leads from outside sources. The Pisa Group can provide name and addresses for households based on the zip codes you would like to target. We can also offer new mover campaigns that target new movers within 7 days of new phone service set up. All of the telemarketing leads we take from local lists are scrubbed against a National Database in order to eliminate second phone and fax lines as well as against State and Federal DNC lists. When calling previous customers and additional telemarketing leads, our telemarketing sales professionals act as representatives of your company. They are trained to be courteous, enthusiastic, and informative. 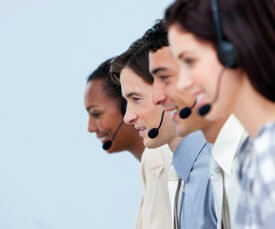 Our sales representatives are put through stringent training before coming into contact with your telemarketing leads. During this training, they are familiarized with every aspect of your newspaper including the distribution and content of your product. The main benefit of working with our telemarketing services when contacting telemarketing leads obtained from within your company is our ability to sell. Our representatives are trained to be aggressive when securing a sale without being pushy. We guarantee the quality of each start that we sell. Therefore, all new orders are verified before they are submitted to you. This results in a lower than average chargeback percentage and less administrative work for your staff.